This site on the top of a steep basalt stack 100 feet above the ocean and isolated from the coast by a 20-foot chasm has long been used as a defensive holding. Evidence that it was once an early Irish fort includes a souterrain located under one of two towers. The fort and subsequent castle must have looked very formidable to attackers. On a clear day you can look over an expanse of ocean to Donegal and around to Islay, a view which has remained unchanged for centuries. 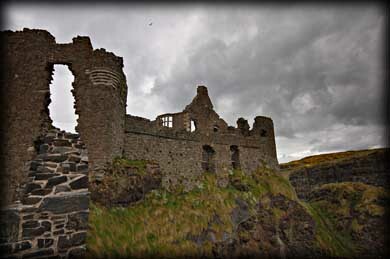 Some of the ruins at Dunluce may date back to the 1200s', but It is believed that the castle was built by Richard de Burgh, second earl of Ulster and one of the most powerful Irish nobles of the late 13th and early 14th centuries during the Anglo Norman period in Ireland. It was taken in battle around 1565 by ‘Sorley Boy MacDonnell’ (Yellow Charlie), a Scottish chieftain who controlled the northeast coast of Ireland as the Earl of Antrim. The castle was indeed a fine residence, with many possessions brought from the royal court in London, creating a 'palace washed on all sides by the sea'. As Scottish merchants settled there a thriving village grew up around the castle, but it was burned in a 1641 rebellion by an Irish army. 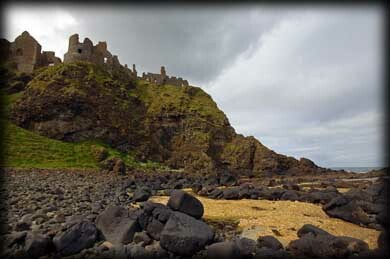 After the Battle of the Boyne in 1690 and the impoverishment of the McDonnells because they had adhered to the cause of James II, Dunluce Castle was abandoned and Ballymagarry House nearby became the Earls of Antrim's main residence. Since that time, the castle has deteriorated and parts were scavenged to serve as materials for nearby buildings. Situated: Could not be easier. 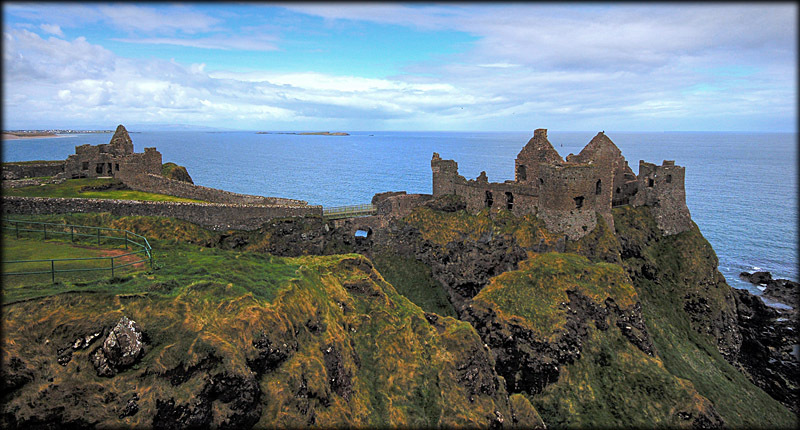 Dunluce is located on the north Antrim coast, 3 kilomertes east of Bushmills on the A2. There is a small entrance fee to enter the castle. Discoverer Map 5: 904 413. Last visit April 2010.